We’d love your help. 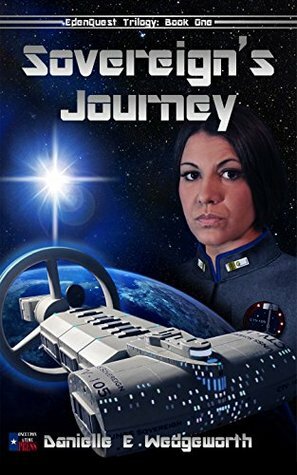 Let us know what’s wrong with this preview of Sovereign's Journey by Danielle E. Wedgeworth. To ask other readers questions about Sovereign's Journey, please sign up. The first book of this series. A thought provoking look at a possible future. Danielle Wedgeworth writes a fast-paced adventure, all while weaving challenging concepts of government control, freedom, religion, and human nature. This book makes you think, while spinning an entertaining sci-fi tale. Her characters are interesting, sympathetic, and complex. As a reader I became emotionally engaged in their challenges. There were times I could hardly read fast enough! Wedgeworth has a military backgr The first book of this series. A thought provoking look at a possible future. Danielle Wedgeworth writes a fast-paced adventure, all while weaving challenging concepts of government control, freedom, religion, and human nature. This book makes you think, while spinning an entertaining sci-fi tale. Her characters are interesting, sympathetic, and complex. As a reader I became emotionally engaged in their challenges. There were times I could hardly read fast enough! Wedgeworth has a military background. It comes through nicely with details when the story deals with military issues. The author manages to utilize the science fiction genre to her advantage as she explores how religion, politics, and the idea of marriage equality evolves as the human race advances as space travelers. this story weaves personal freedom against government control for an exciting first book in her trilogy. this book would work well to be read alone, but I am excited about the release of book two! Danielle graduated from a private Christian University in nineteen-eighty-four and worked as a retail manager for a couple of years until joining the United States Army. Serving as an enlisted soldier, NCO, and as a commissioned officer, Danielle gained a well-rounded overview of military life. She served in both the regular army and the National Guard during the late nineteen-eighties and the fir Danielle graduated from a private Christian University in nineteen-eighty-four and worked as a retail manager for a couple of years until joining the United States Army. Serving as an enlisted soldier, NCO, and as a commissioned officer, Danielle gained a well-rounded overview of military life. She served in both the regular army and the National Guard during the late nineteen-eighties and the first part of the nineteen-nineties. Since then, she has worked for major corporations as an IT Leader, and she is a small business owner. Now, opening another chapter, Danielle is beginning a new phase of activism, the goal of which, is to promote Americans to cherish their freedom and to think for themselves. She hopes to encourage readers to fiercely protect their individual civil rights and to care for their neighbors. Writing Phoenix Republic, The Lone Star Gambit is the kick-off for this adventure.